Homepage. This page: A letter from the 1920s, sent by the Hercules cycle firm to its distributors prior to the Christmas sales. Items relating to two-wheeled machines rather than four-wheeled do appear on the site from time to time, including write-ups regarding vintage and classic bicycles. 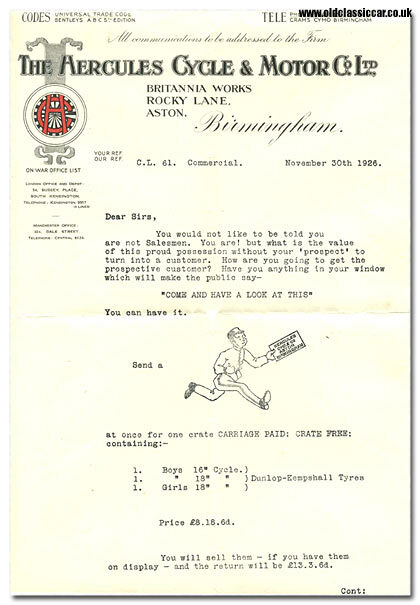 This letter was sent from the Hercules Cycle and Motor Co. Ltd. of Aston, Birmingham, in November 1926. Its aim was to gee up the salesmen at its authorised sales outlets, prior to the Christmas sales rush. There is no mention of the specific sales agency that this two-page letter was posted out to, so it seems reasonable to assume that it went to all authorised stockists of Hercules cycles. Letter from the Hercules Cycle & Motor Co. Ltd.
"COME AND HAVE A LOOK AT THIS"
You will sell them - if you have them on display - and the return will be £13.3.6d. All parents buy their children a 'YULETIDE PRESENT' spending 15/- 20/- 25/- for 'Toys' which are cast on one side after the festive season. For the same amount of cash paid down you can give to them a 'REAL BICYCLE' - last for years - on the Easy Payment Scheme. It is up to you to put the proposition before the residents in your district; you can do it in reality with a show of these Juvenile Machines included in the Christmas Window Dressing. There is no need to enlarge upon the merits of our productions - your sales have spoken louder than words. SEND YOUR MESSAGE RIGHT AWAY. The Hercules Cycle and Motor Co. Ltd. Pedal Cycles by Mass Production. Birmingham is the home of the biggest factory in the world devoted solely to the manufacture of pedal cycles. Here production has been speeded up on scientific mass production lines till it averages scores of thousands of machines a week. This phenomenal output is, indeed, a romance of the cycle trade, and, incidentally, a convincing argument to those who predicted the doom of the pedal cycle when motorcycles became so cheap. Here is one firm alone directly or indirectly providing employment in cycle building for between 20,000 and 25,000 people, and turning out machines at the rate of about three a minute, without straining its plant and resources. The Hercules Cycle and Motor Company Ltd, of Rocky Lane, Aston, is indeed the Morris of the cycle world. Sixteen years ago it was started in some cottages converted for manufacturing purposes in Conybere Street. For a time the men behind it were satisfied with an output of about half a dozen machines per week, but they were men of big ideas and full of confidence in the cycle trade and their own ability to make good. They progressed by easy stages, and even as recently as 1922 they were still housed in a comparatively small factory, but their output had jumped to 700 machines per week. Early in the following year extensions were made, giving their factory a floor space of 43,000 square feet, and their production began not in hundreds, but in thousands. But this was not the height of their ambition, or, indeed, the demand of the home and foreign market. Three thousand machines a week were then being made and sold, but the demand exceeded the supply, and further extensions of the factory were made, which increased the productive capacity to 10,000 cycles a week. Developments were still to follow, and in June of last year the factory was extended to cover an area of 11 acres, and when it is put to the test it can turn out approximately 30,000 cycles a week. Where do all these bicycles go, for in varying degrees dozens of other firms in and around Birmingham are sharing the prosperity of the cycle boom? So far as this one firm alone is concerned, 70 per cent of their output during the winter months goes all over the world. The balance is adjusted in the English summer, but, taking it all the year round, 50 per cent of the machines are exported. That means, according to the chartered accountant's figures, one Birmingham factory alone sent half of its last year's output of 200,000 machines to meet the needs of every race on the globe. To-day in the works in Catherine Street, Aston, nearly 4,000 people are working, but the firm has controlling interests in two or three cycle component firms, and it is estimated that the total number of people working directly or indirectly for Hercules Cycles is in the neighbourhood of the figures quoted. During the present financial year, which started in September, output has already exceeded the five-figure mark on three occasions. More items of paperwork relating to motoring can be found in the Motoring Collectables section, whereas items specifically relating to old bicycles and cyclists will continue to be added in here.